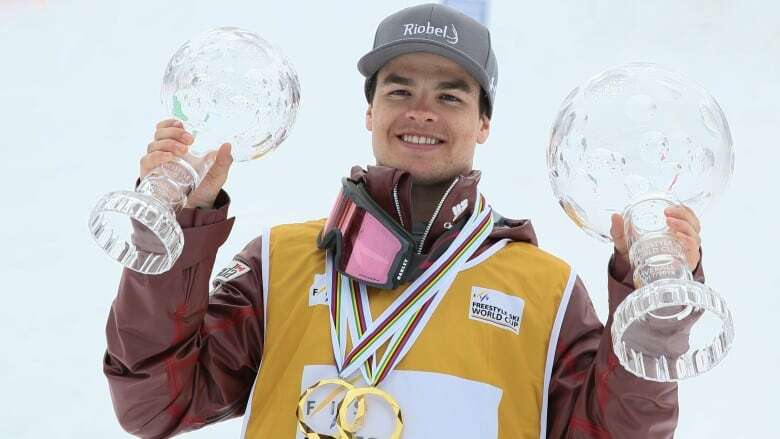 Canadian Olympic champion Mikael Kingsbury finished on the top of the podium in his final World Cup event of the 2017-18 season, wrapping up the season with a gold medal, as well as two Crystal Globes as overall moguls champion as well as top freestyle skier across all disciplines. The 25-year-old from Deux-Montagnes, Que., finished first on Sunday in the men's dual moguls in Megeve, France, wrapping up the season with two Crystal Globes as overall moguls champion as well as top freestyle skier across all disciplines. "I had a tough bracket to go through and managed to win every round," Kingsbury said. "This year I had two goals — winning the Olympics and winning the two Crystal Globes, and I got exactly what I wanted. "It's kind of crazy that my worst result this year was a sliver." Fellow Canadian Olympic medallist Justine Dufour-Lapointe scored a bronze in women's dual moguls on Sunday, finishing behind American Jaelin Kauf and Perrine Lafont of France. "I was really happy. It wasn't easy at first but I was able to pull it together, telling myself this is the last competition and I have to give it my all and enjoy doing it," Dufour-Lapointe said.